In recent months we’ve seen the arrival of a more complex Facebook social media search thanks to Graph Search, Twitter improvements in the same area and now the introduction of hashtags on Facebook. Social media is becoming more like search engines than ever before. So, logic would dictate that now is the time to optimise for better social media search. Better social search provides a whole host of opportunities and many of the tactics used in better SEO can be used here too to gain leverage over competitors. So, we’re going to look at some things that can improve your visibility in social. Being thin on on-site content is an issue for both traditional sites and now social media profiles. Social media profiles need to be completed to the fullest degree possible. The more information available on a page that there is the more that’s there to match a user’s social media search criteria. In addition, page owners should also consider synonyms to describe terms they want to be searched for. Also, make sure to include a link to your site to ensure people find your home page. Not so long ago, tweets and updates of over a certain age didn’t really matter – however this has now changed. Twitter has been opening its archives and Facebook now provides search updates for up to a month and this is set to improve. So, users should now consider doing some keyword research and using these terms in their updates on social media sites. If you want people to find you for relevant key terms via social search options, this is the way forward and especially so with the introduction of hashtags on Facebook. 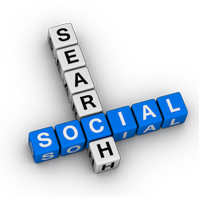 Currently, social media search is a quite basic form of search. That said it’s come a long way in a short time and we expect this to be continuously the case. Updates and visibility are certainly improved by compelling updates that receive Likes and +1s etc. In addition, expect authors of updates to also have a part to play in the power to increase discoverability. Assume extra weight to be given to profiles with more followers, older profiles etc. Of course, the discoverability of all that old data can also throw up issues for companies who have had social media reputation issues in the past. The resurfacing of old posts can be as beneficial and it can be damaging. So, if you’ve had any issues, focus on creating as positive as reputation from now on as possible. You want to create shareable content that is endorsed and receives positive comments to ensure you put your best foot forward. Social Media Search is nowhere near as popular as traditional search via Google etc. However, consumer habits change, especially as their search improves. The more honed social search becomes, the more people will use it as a replacement for search engines. Beginning now gives you a ten yard head start on competitors. So, what are you doing? Need help preparing your business for social media search? Get in touch to learn more about our social media optimisation services.